The leadership of the F-35 Lightning II program has passed from a United States Air Force veteran to a Vice Admiral of the Navy, with Lieutenant General Chris Bogdan stepping down as Program Executive Officer. Described as a veteran of leading complex defense acquisition programs, Vice Admiral Mat Winter assumed the watch, thanking Lt Gen Bogdan for his leadership and vision from the program's initial development. "Since he took helm of the F-35 program in 2012, General Bogdan’s acquisition leadership has been bold, effective and decisive. His approach matured our relationships throughout the F-35 enterprise and set us on a course for success," VADM Winter said. As PEO, Lt Gen Bogdan was responsible for overseeing the $379 billion program, which is simultaneously developing, testing and fielding three next generation strike fighter aircraft for the US Air Force, Navy, Marine Corps, eight international partners and three foreign military sale countries. Lt Gen Bogdan’s departure as PEO also coincides with his retirement after more than 34 years of Air Force service. With the change in PEO from Air Force to Navy, the program’s service acquisition executive switches from Navy to Air Force. "It’s been an honour to serve alongside so many great leaders and support our nation and allies," said Lt Gen Bogdan. "The F-35 weapon system is now operational and forward deployed. The size of the fleet continues to grow and we are rapidly expanding its capability. The F-35 will form the backbone of United States air combat superiority for decades to come and I know the program is in good hands as we transition leadership today to Vice Admiral Winter." As deputy PEO for the past six months, VADM Winter has become familiar with the current state of the program, its complexity, and its people. "The F-35 program is more than a program; it is truly a global enterprise built upon a broad spectrum of stakeholders joined together by a common goal – to support the warfighter," VADM Winter said. "Our warfighters, stakeholders and JPO teammates have my commitment to provide timely continuous communications, make prudent transparent decisions and deliver on our commitments through crisp, accountable execution. These core tenets of my commander’s intent will focus our thinking as we transition to the follow on development phase, ramp up to full rate production and expand global sustainment operations for the growing F-35 fleets and forces." In addition to his previous role as the Chief of Naval Research, VADM Winter’s flag tours include serving as the commander, Naval Air Warfare Center Weapons Division, China Lake/Point Mugu, CA; assistant commander for Test and Evaluation, Naval Air Systems Command; PEO for Unmanned Aviation and Strike Weapons; and Director, Innovation Technology Requirements and Test & Evaluation. VADM Winter served operational tours as an A-6E Intruder Bombardier/Navigator with Attack Squadrons 42, 85 and 34. He completed multiple deployments aboard aircraft carriers USS Saratoga (CV 60), USS America (CV 66), USS Dwight D. Eisenhower (CVN 69) and USS George Washington (CVN 73). His acquisition tours include assistant deputy program manager (DPM) for the Joint Standoff Weapon System; chief engineer for JSF Integrated Flight and Propulsion Control; DPM for the Tactical Tomahawk All-Up-Round development program; and his major acquisition command tour as the Precision Strike Weapons (PMA-201) program manager. A 1984 graduate of the University of Notre Dame with a Bachelor of Science in Mechanical Engineering, VADM Winter received his commission through the Naval Reserve Officers Training Corps and was designated a naval flight officer in 1985. He holds a master's degree in computer science from the Naval Postgraduate School and another in national resource strategy from National Defense University’s Industrial College of the Armed Forces; and a Level III certification in program management and test & evaluation from the Defense System Management College. Australia is set to receive 72 F-35A aircraft, with the full fleet in service by the end of 2023. Two, AU-001 and AU-002, have been delivered and each cost more than US$120 million. Over 30 Australian companies have already participated in production supply chains to provide high-end solutions to the JSF capability. 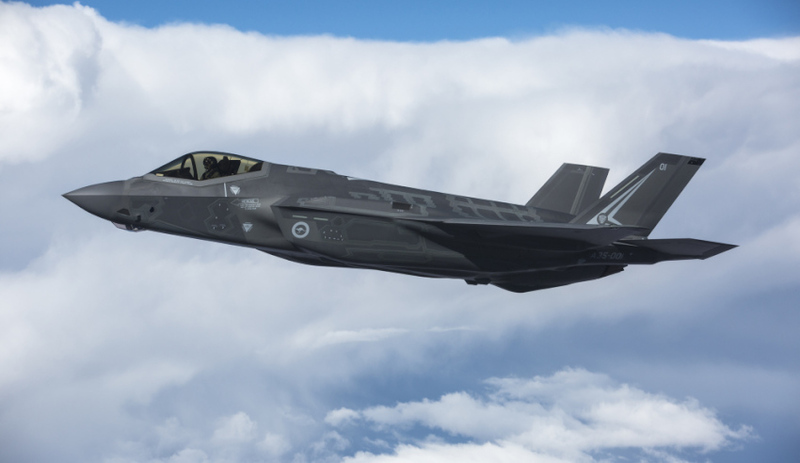 The current cumulative total of Australian JSF production contracts is US$681 million and is forecast to reach almost US$4 billion in 2038.